So New Forest commoners, the families who own the animals that graze the Forest, have teamed up with other organisations to take their drive safe campaign on the road this winter. They have produced five near-life-size animal silhouettes that display the number of ponies, cattle, donkeys, pigs and sheep killed last year. The silhouettes will be placed in local towns and villages throughout winter. 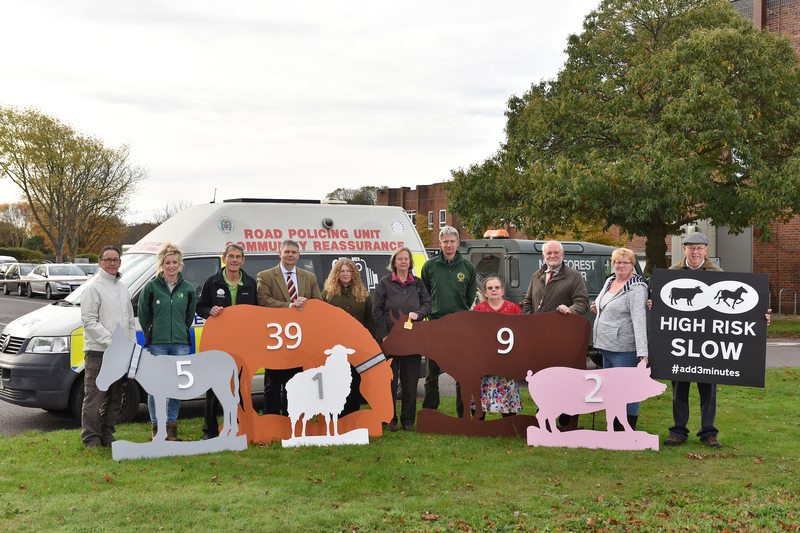 They provide an eye-catching reminder of the importance of driving carefully to local people, who are responsible for the majority of animal road deaths. Although the total number of deaths is 40% lower than a decade ago, thanks to a range of initiatives, there is still much work to be done. Poor driving on New Forest roads can have devastating effects. Commoner James Young, whose pony Brock Brocade was killed in a hit and run incident, said: ‘This is the most worrying time of year for every family making the effort to keep the Forest properly grazed. Pure-bred New Forest ponies like Brock Brocade are now a rare breed. Every one matters to its owners and to the Forest. Sue Westwood, Clerk to the Verderers, said: ‘Drivers should be aware that they are very likely to encounter animals on the Forest’s roads, day and night. Animals don’t have road sense so please help avoid accidents by driving slowly and carefully. Nigel Matthews, of the New Forest National Park Authority, convenes the Animal Accident Reduction Group of local organisations. He said: ‘The majority of commuters are responsible, slow and careful drivers across the Forest. But it’s easy to get complacent and we know that you are three times more likely to kill or injured an animal in the Forest after the clocks go back than before. If you are involved in a road accident involving livestock ring the police on 999 (emergency) or 101 (non-emergency).